Insights into Veterinary Endocrinology: Is Hill's y/d a Nutritious Diet for Hyperthyroid Cats? 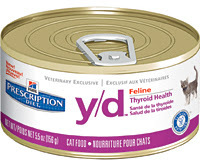 Is Hill's y/d a Nutritious Diet for Hyperthyroid Cats? As I discussed in my last post, Hill's Pet Nutrition recently released Prescription Diet y/d Feline –Thyroid Health (1), an iodine deficient diet that can result in lowered serum T4 concentrations when fed as the sole source of nutrition to hyperthyroid cats. With all of the recent hype and widespread promotion of this diet, one could be persuaded into believing that feeding y/d is now the treatment of choice for cats with hyperthyroidism. According to the Hill's website and marketing ads that I'm sure most of you have seen, the y/d diet "improves thyroid health in 3 weeks" when fed to cats with hyperthyroidism. The ads also state that the diet provides "Complete daily nutrition with a taste your cat will love." In addition to reduce T4 hormone production, y/d allegedly helps support kidney health by controlling phosphorus and sodium, and y/d is also said to help support urinary tract health (1). Overall, this diet seems almost too good to be true. So, in this post, I want evaluate this diet to address the single question — Is Hill's y/d a nutritious diet designed to address the metabolic needs of the older, hyperthyroid cat? As discussed in my previous post on "The Best Diet to Feed Hyperthyroid Cats," we have abundant evidence that hyperthyroid cats should be fed a diet that is high in protein content (>50% of total calories). Cats as obligate carnivores are unique in their need for large amounts of dietary protein (2,3). This absolute requirement for dietary protein intake in cats is critically important when formulating a diet for hyperthyroid cats, in which protein catabolism and muscle wasting is universally present (4-6). Remember that protein is the primary macronutrient responsible for maintenance of muscle mass. Restoring and preserving any remaining muscle tissue in cats treated for hyperthyroidism depends upon the cat consuming a diet with sufficient amounts of high-quality protein. This recommendation for higher amounts of dietary protein does not change once euthyroidism is restored. The dogma that all older cats be fed reduced energy “senior” diets must be questioned based on what is now known about the increasing energy requirements and nutritional needs of older cats (7,8). The higher maintenance energy requirements of geriatric cats, in combination with their impaired ability to digest protein, will lead to loss of muscle mass if their overall energy and protein needs are not met (7-10). When selecting or formulating the ideal diet for a hyperthyroid cat, remember that not all proteins are equal in quality (11). This is especially true for commercial pet food diets. High-quality meat is the best ingredient in a cat food and meat by-products are a close second. Some vegetable and grains are fine, but they supply a less bioavailable form of protein for cats and should not be the primary source of dietary protein for a hyperthyroid cat. Remember that when deprived of protein, cats will continue to break down muscle tissue to create the energy they need (2,3). By feeding only high-quality protein diets, we will help restore the hyperthyroid cat’s muscle mass and improve strength and agility. In addition to high protein requirements, we also have good evidence that hyperthyroid cats will benefit by feeding a diet low in carbohydrates (<10% of total calories). As discussed in my previous post on "The Best Diet to Feed Hyperthyroid Cats," many hyperthyroid cats have subclinical diabetes as evidenced by their mild hyperglycemia, glucose intolerance, and insulin resistance (12,13). Feeding a low-carbohydrate diet will improve insulin sensitivity and help stabilize glucose metabolism in these cats (14). This may also prevent the development of overt diabetes and control long-term obesity after successful control of their hyperthyroid state. Overall, I believe that it makes sense to feed most hyperthyroid cats (as well as normal and diabetic cats) a diet composition close to what they would be getting in the wild (2,3,15-17). That would be a diet composed of approximately 50-70% protein, 5-10% carbohydrates, and 30-40% fat. Because older cats also lose lean muscle mass in association with the “sarcopenia of aging,” this diet composition needs to be continued even after one treats the cat’s hyperthyroidism and restores a euthyroid state. What's the Composition of Hill's Prescription y/d Diet? The most accurate way to evaluate pets foods and their composition is to consider the calories or metabolizable energy (ME) that come from the protein, fat, and carbohydrate fractions (18). This allows us to compare various diets without worrying about their different moisture levels. Looking at the composition or caloric distribution of Hill's y/d diet in this way reveals that it's a high-carbohydrate, low-protein diet (Table 1). The percent ME from carbohydrates is 23-24%, whereas the percent ME from protein is 27-28% (19). Compared to a cat’s natural diet in the wild, y/d is 2.5 to 5 times higher in carbohydrates and contains only half of the amount of protein normally ingested (Table 1). Feeding y/d for long periods is less than an “ideal” diet for an obligate carnivore, especially in hyperthyroid cats with severe muscle wasting or sarcopenia of aging (3,4,9). Are the Ingredients Found in Hill's Prescription y/d Diet Ideal? Unfortunately, the ingredients present in y/d are also far less than ideal for cats. In addition to the fact that y/d is a low-protein diet (Table 1), most of the diet’s protein is derived from plant sources. 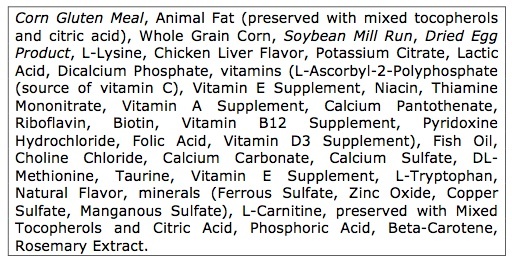 This is especially true for the dry formulation, in which the only listed animal protein on the label is "dried egg product," and this is the fifth ingredient (Table 2). In other words, this diet does not contain any meat. The primary protein source in dry y/d is corn gluten meal, commonly used in many pet foods because of its low cost. 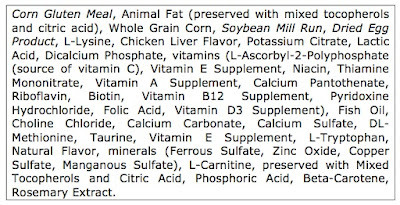 Prescription Diet y/d dry also contains "soybean mill run," which is a cheap, by-product filler. Soy may contain enzyme inhibitors that impede normal protein digestion. Most importantly, soy is a known thyroid goitrogen and is considered to be one factor that may contribute to hyperthyroidism in cats (20). Because Hill's y/d diet is a high-carbohydrate, low-protein diet, feeding this diet for long periods is less than ideal for an obligate carnivore, especially in hyperthyroid cats with muscle wasting or older cats that have sarcopenia of aging (which all cats on a protein deficient diet will likely develop). In addition, the protein sources, especially for the dry food, are of inferior quality. Is it logical to feed vegetable protein to a obligate carnivore? Finally, it is very unclear why there is such a discrepancy in protein sources between the dry and canned formulations of the y/d diet. If Hill’s can provide animal-based proteins for the canned version, why can’t it be also done for the dry y/d? MacDonald ML, Rogers QR, Morris JG. Nutrition of the domestic cat, a mammalian carnivore. Annual Review of Nutrition 1984;4:521-562. Zoran DL. The carnivore connection to nutrition in cats. Journal of the American Veterinary Medical Association 2002;221:1559-1567. Peterson ME, Kintzer PP, Cavanagh PG, Fox PR, Ferguson DC, Johnson GF, Becker DV. Feline hyperthyroidism: pretreatment clinical and laboratory evaluation of 131 cases. Journal of the American Veterinary Medical Association 1981;183:103-110. Joseph RJ, Peterson ME. Review and comparison of neuromuscular and central nervous system manifestations of hyperthyroidism in cats and humans. Progress in Veterinary Neurology 1992;3:114-119. Baral R, Peterson ME: Thyroid Diseases, In: Little, S. (ed), The Cat: Clinical Medicine and Management. Philadelphia, Elsevier Saunders, in press. Little S: Evaluation of the senior cat with weight loss, In: Little, S. (ed), The Cat: Clinical Medicine and Management. Philadelphia, Elsevier Saunders, in press. Sparkes AH. Feeding old cats— An update on new nutritional therapies. Topics in Companion Animal Medicine 2011;26:37-42. Patil AR, Cupp C, Pérez-Camargo G. Incidence of impaired nutrient digestibility in aging cats. Nestlé Purina Nutrition Forum Proceedings. 2003;26,2(A):72. Thompson A. Ingredients: where pet food starts. Topics in Companion Animal Medicine 2008;23:127-132. Hoenig M, Ferguson DC. Impairment of glucose tolerance in hyperthyroid cats. Journal of Endocrinology 1989;121:249-251. Hoenig M, Peterson ME, Ferguson DC. Glucose tolerance and insulin secretion in spontaneously hyperthyroid cats. Research in Veterinary Science 1992;53:338-341. Rucinsky R, Cook A, Haley S, Nelson R, Zoran DL, Poundstone M. AAHA diabetes management guidelines for dogs and cats. Journal of the American Animal Hospital Association 2010;46:215-224. Myrcha A, Pinowski J. Weights, body composition and caloric value of post-juvenile molting European tree sparrows. Condor 1970;72:175–178. Vondruska JF. The effect of a rat carcass diet on the urinary pH of the cat. Companion Animal Practice 1987;1:5-9. Crissey SD, Slifka KA, Lintzenich BA. Whole body cholesterol, fat, and fatty acid concentrations of mice (Mus domesticus) used as a food source. Journal of Zoo and Wildlife Medicine 1999;30:222-227. Laflamme DP. Determining metabolizable energy content in commercial pet foods. Journal of Animal Physiolology and Animal Nutrition (Berlin). 2001; 85:222-230. Veterinary Information Service, Endocrinology Message Boards — Y/D Prescription Diet for Hyperthyroid Cats. Dietary data posted on July 18, 2011 by Rosalie Behnke, Hill's Veterinary Consultation Service. Peterson ME, Ward CR. Etiopathologic findings of hyperthyroidism in cats. Veterinary Clinics of North America Small Animal Practice 2007;37:633-645. I reckon you'll be the only vet not thrilled with this dietary "solution" to hyperthyroidism who is speaking his mind. I'm sure vets are stocking their clinics as we speak. I looked over a blurb on the research and it struck me that one of the points was that the food for an HT cat shouldn't go up and down wildly in iodine content. A whole 'nother issue and perhaps more relevant. Yes, Vets may be stocking their clinics with Y/D, but isn't it true that the major manufacturers of massed produced cat food have many vets in their pockets???? I just wanted to thank you for your excellent blogs. My cat has been wasting away for over a year now. Whilst the vets diagnosed hyperthyroidism they have given some very poor advise in terms of dietary requirements. I had another cat that also developed hyperthyroidism, and after following the vets dietary advise, she died about a year later. The vets just seem to want to push the food they keep in stock with little regard for the actual dietary requirements of their patients. It wasn't until I went in with your blogs, and other papers, in hand that they changed their tunes. I'm hopeful I can at least partially reverse the muscle loss my boy and buy him some extra quality time. Again thank you for the excellent and insightful blogs. Thank you for your kind comments. I do hope that you can get some muscle mass back on your cat, or at the very least, stop the loss of muscle mass that is so prevalent in our older cats. Well, that is one of the major problems with the y/d diet as a treatment for hyperthyroidism. You can NOT supplement the y/d diet with any fish, chicken, or meat because they all contain iodine that will interfere with diet (which contains almost no iodine, and that is how the diet works). If you supplement with any other food or treats that contain any amount of iodine, the y/d diet will fail to lower the T4 value and your cat will remain hyperthyroid. It's unfortunate that your cat developed an allergic reaction to the antithyroid drug medication. Have you considered treating your cat with radioiodine or surgical thyroidectomy? Or is that not possible? My cat has only just been diagnosed. The vet suggested trying the Hills diet food before trying the drugs. She is eating the dry but does not like the tins. I am becoming concerned about the diet as I read more about it. Is it possible to add good (low iodine) protein to the diet food? She is also missing the little treats she always had, is there anything we can give her? This is the problem with the y/d diet as a treatment for hyperthyroidism. The diet doesn't cure the thyroid tumor - by being an ultra-low iodine diet, it just limits the amount of thyroid hormone the tumor can secrete. You can't add any other source of protein to this diet because all protein will likely contain at least small amounts of iodine. Same for most cat treats. Feeding ANYTHING with even a tiny bit a iodine will cause this form of treatment to fail. If you cat is relatively young (<15 years, and certainly <13) and healthy, you might want to consider a definitive treatment to cure the problem. These include either radioiodine or surgical thyroidectomy. My 16 yr old cat just got diagnosed with hyperthyroid and is also allergic to the medication, the vet only suggested the y/d diet after she discovered the allergic reaction to the meds. I just read an article about protein stating "Protein foods that do not contain iodine include egg whites, fresh meats that have not been cured or processed, wild game and fresh poultry. Vegetable sources of protein that are iodine-free include unsalted nuts and peanut butter, lentils and beans. No fish, seafood or dairy are allowed on an iodine-free diet" so if I can get some fresh Deer meat or a fresh chicken to cook with just egg whites do you think this will be ok as a supplement? I know that some web site (http://www.livestrong.com/article/107373-foods-iodine/) state that there are foods that have no iodine. Unfortunately, they aren't talking about creating a state of severe iodine deficiency needed to lower the serum T4 and T3 values in a cat with hyperthyroidism. Hill's y/d food is extremely low in iodine - making it an iodine deficient diet. Iodine is found in most soils and therefore plant foods. If cattle or deer eat plants that contain iodine, they will have some iodine in their meat. Remember that iodine is an essential nutrient for all species - not just humans and cats! For y/d to work, you cannot use any protein supplement because all will contain at least small amounts of iodine - maybe not much at all, but enough for the cat's body to use it to make thyroid hormone. My 17 year old cat has an overactive thyroid and is losing weight even though she is on methimazole gourmeds medication. The medication has improved her thyroid levels but she continues to lose weight. The vet recommended trying Hills a/d. Any thoughts about this and and recommendations for alternative diet to increase her weight? The latest (unpublished) research shows that older cat need at least 5 gram of protein per day to prevent weight loss and muscle wasting. I find your article very interesting and informative. We have two hyperthyroid cats. One does very well on the medicine while the other had a severe allergic reaction. Because of her age and how ravaged she was by the reaction, we didn't want to do radiation or surgery. The vet suggested that may be we could try y/d. She had no idea whether it would work, but like us, she thought there was nothing to lose. Slowly, the cat improved, and she is doing well. Who know if this food will be good for her long term (I take your comments seriously about what cats truly need in their diet), but she's almost 16, and she has enjoyed a life that she would not have had. Considering her situation, it was worth a shot. I consider y/d another treatment option for hyperthyroidism. If the cat will eat the food (and not eat anything else) the y/d certainly will lower the serum thyroid hormone concentrations. Like methimazole, feeding an ultra-low iodine diet does not address curing the primary cause (ie, the thyroid tumor). The thyroid tumor, which will almost always be benign at time of diagnosis) will continue to grow with time. In some cats, this benign tumor can also transform to a more malignant carcinoma after a few months to years. So that's why I believe it's always better to remove the thyroid tumor with surgery or ablate it with radioiodine -- we are curing rather than prolonging the disease. Now, if you consider 16-year's of age too old for definite treatment, then methimazole or y/d can be used. But, by the way, I don't consider 15-16 years of age too old for definitive treatment in most cats unless other concurrent problems are present that we know we shorten their life. Remember that old age itself isn't a disease, and I see many cats that are are doing well at 19-20 years of age. The only advantage of the methimazole over the y/d is that we can control what the cat eats - I recommend feeding a low-carb, high-protein diet that is most natural for what cats should eat. Remember that the y/d is too high in carbs, and much too low in protein (and the protein that's contained in the y/d is all plant protein - when was the last cat in the wild who was a vegetarian?). Senior cats don't absorb protein as well as younger cats and will develop weight loss and muscle wasting as they age. Other than exercise (and good luck with getting most cats to enter a weight lifting regime), the best way we know to maintain muscle mass is to feed a higher protein diet (>40% of calories as protein). Overall, it's your decision what treatment to use for your cat. And any treatment, including the y/d, is better than no treatment at all. But I like to treat the whole animal, however, and that involves more than just giving pills, feeding an iodine-deficient diet, or even giving an injection of radioiodine. For me, that involves proper nutrition, supplements in some cats, and finally, environmental stimulation to help enrich their lives. You are very welcome. I'm happy to hear that you found the post to be helpful. We didnt realize y/d was not good for cats. Our 13 year old kitty has been eating this food for awhile and we have noticed her getting smaller. Would you recommend putting her on thyroid medication so she can have an adequate diet? We want our cat to live as long as possible & enjoy life. What does the radio-iodine procedure involve? Is it expensive? Does this procedure make it dangerous to handle cat poop for awhile? We agree that the y/d food only prolongs the disease but we are afraid of the procedures because of our cat's age and fragility.. Thanks for your help. Your article is very helpful, we have been feeding our 13 year old kitty y/d for awhile now and have noticed her getting smaller. We were wondering if we should put her on medication in order for her to have a more balanced diet. Although she is not too old, the procedures listed to "cure" hyperthyroidism look both expensive and risky. Is there one less dangerous to our cat's health? We want her to live a long and happy life, and it looks like she won't be able to if we keep her on this diet! Thanks for the help. First of all, it is likely that your cat looks "smaller" because of the loss of muscle mass that can occur in an older cats if not fed enough protein. In my opinion, we should try to remove or destroy the tumor in any cat that is relatively young and in good health otherwise (13 years certainly is not very old for a cat- that is only about 55-60 in human years). By choosing either surgery or radioiodine, we have cured the disease and do not have to feed an iodine deficient diet or use life-long, twice daily medication. In most cats, leaving the tumor allows it to continue to grow larger and larger, and in some cats, the benign tumor can transpose into a malignant carcinoma. Radiodine is generally considered to be the treatment of choice. Compared to surgery, we don't need anesthesia and we don't have to worry about parathyroid damage (the 4 little glands around the thyroid that control calcium) or possible hypocalcemia. For more information about the pros and cons of radioiodine, see my website (www.animalendocrine.com). If done properly, radioiodine is not at all risky. At our facility, most cats only stay with us for 3-5 days and you can see your cat on the webcams we have installed within each of their condos. Like you, I too want all cats to live a long and heathy life. In cats with hyperthyroidism, I believe this includes curing the disease so we can focus on proper nutrition and environmental stimulation and enrichment. Part of the "enrichment" I'm talking about is not giving live-long medication, since this will reduce the cat's level of stress, which we do see in some cats that have to be chronically mediated. Your article and blog is very helpful. My cat is almost 14 and was diagnosed with hyperthyroidism just over 6 months ago. We put him on this Y/D diet and his thyroid levels are now fine and he even gained a small amount of weight back. However, he seems to have developed a severe allergy and is licking himself all the time. I'm on my way to see the vet shortly and expect that we'll have to try something else. Has anyone else's cat had an allergic reaction to this food? I have not heard of an "allergic" reaction to the Hill's y/d diet, but it certainly could be possible. Some uncontrolled hyperthyroid cats will like excessively, but if he is controlled on the y/d, that should not be the case. If you stop feeding the y/d diet for a week or two and the licking resolved, then you know it's probably the diet. You've said that y/d doesn't have enough animal protein for your liking, but you've also noted that most animal proteins are not iodine deficient. Do you have a recommendation for an iodine deficient diet that does have enough protein? There are not any "natural" low-iodine diets that are high in protein. We would have to feed the animals (chickens, cattle, etc) a diet that is deficient in iodine in order to get meat with a low iodine content. To my knowledge, that is not being done anywhere in the world, at least not intentionally. I have a 13 year old male cat who have been battling hyperthyroidism over the last few year, but also anemia. He had an emergency blood transfusion (that was a fun Wednesday) last June and we have been battling to get his hemadocrit levels back in the 'normal' range. He take 1ML of Prednisolone 3xs a week, Denamarin & 10mg of Famotadine daily. He can't take Tapozole and radioiodine treatment was ruled out recently due to the 'roll of the dice' as we don't know how it will impact his kidney, liver, etc. We (vet and I) just aren't sure we would survive. He has a checkup last Friday and we got his bloodwork back and he is once again under the normal hemadocrit level an his thyroid level is up to 5.7 (it was 3.5 a couple months ago). So the vet mentioned the YD diet by Hills. My cat is currently eating LD and has been for years. Right now, I'm not sure what to do. We are military and will be moving again in July and I'm nervous his health is going to be impacted by the stress of the move. I would like to at least try to get him 'stable' over the next couple of months before we move. Any advice or questions you could suggest I present to my vet would be GREATLY appreciated. Why is your cat anemic? Anemia is a sign -- not a disease. For the next step, I would try to better determine why the anemia is present - bone marrow, xrays, tick titers, viral testing, etc. We can see anemia secondary to methimazole but it sounds like you haven't been giving that medicine. In the meantime, it sounds like y/d is a reasonable short-term option. You could certainly try that until the anemia issue is worked up and the cause determined so it can be treated. Once stabilized (if possible), then surgery or radioiodine would certainly be the best treatment- especially in a stable, 13-year old cat. I'm happy to hear that your cat is doing better and gaining weight on a better diet. But how are you going to treat the hyperthyroidism? Your diet is not an iodine-deficient diet and will not control the hyperthyroidism. If y/d alone or methimazole cannot be used, your remaining options are surgical thyroidectomy or radioiodine -- I'd consult with your vet about where to go from here. Your blog is very useful. Just heard my cat has hyperthyroidism and whilst she seemed ok on the meds we just had a dramatic few days with her vomiting everywhere for two days and getting seriously dehydrated. After a short spell at the vets she seems better and having stopped the meds we are trying the Hills diet for a while until she is able to have the Radioactive Iodine treatment. Do you think this is a sensible course of action? Any idea how long before the Hills diet kicks in and she might start to regain a bit of weight? I'm very concerned about her. The problem with y/d is that it will take a few weeks (up to 3 months) to see the full effect. So you certainly will not see immediate weight gain. How long are you going to wait before radioiodine therapy? Remember that you could try atenolol (6.25-12.5 mg per day) with L-carnitine (250 mg per day of opened capsule in food). Those drugs will help protect the heart and may help prevent further deterioration of symptoms until you can get definitive treatment. My recently adopted 17 yo cat was diagnosed hyperthyroid in her initial examination. We tried methimazole, but she had a severe reaction to it. My vet then prescribed Hill's Y/D. I would consider surgery or radio-iodine procedure, but she also is FIV+. Would that complicate either procedure? In my opinion, being FIV+ is not a contradiction for either surgery or radiodiodine if the cat is clinically normal. Most of these cats live a long time, despite the FIV infection. After reading the comments on this page regarding the Hills y/d diet for cats with hypertyroidism - we were amazed to read how many people were in the same position as we were - our cat had one thyroid removed about 4 years ago, before Christmas we noticed he was displaying symptoms similar to those he displayed then. When we took him to the vets, blood tests confifmed that his levels were high again. He was put on to vidalta, but within a few days he was vomiting the tablets up or vomiting later on in the day. We spoke to the vets who suggested the diet. We were amazed that after less than 3 weeks our cat was losing so much weight, we could see him getting thinner by the week. We took him back to get his weight checked and levels checked and although his levels were better we were concerned with the weight loss. The vet suggested upping the amount of y/d he was having - but this seemed to have no affect. After another 2 1/2 weeks he had lost a further 420g in weight. We spoke to the vet about our concerns and we settled on trying another tablet which I am happy to say he has not had a reaction to and has been on them for over 2 weeks now. The difference in his appearance is amazing - he has gained weight and looks so much more healthy. We truly believe that had he stayed on y/d he would not have been with us for much longer as he was just fading away. We spoke to the vet and will discuss whether he stays on tablets or if we look at the radioactive iodine treatment as a posibility when his weight and thyroid levels are more stable. My cat had a manageable issue; she was happy, and healthy, and had been for 3+ years. Vet recommended we try this food because a change in food is easier than supplying a pill each day. We followed the transition regime (gradual introduction of food, and reduction in pill schedule). Within 2 weeks, she was eating the food at the recommended level (and then some more). However, her body condition rapidly deteriorated - coat was lackluster and falling out, weight decreased rapidly, behavior was abnormal. Also, she was starting to eat less of the dry, and less of the wet food (over the course of 2 weeks). We left for a long weekend, came back to a terrified cat sitter who reported that she had stopped eating completely. We immediately took her to the vet, but it was too late, she had lost 25% of her body weight, and even after 3 months of nursing we couldn't get her healthy again. Prior to this food, she was healthy: after this food, she was near death, and ultimately did die. I did some more digging and reading. This food has no peer-reviewed clinical evidence in support of the claims it makes. The literature I was provided are "promotional materials" and the scientific literature does not support the "science" supposedly in this diet. Further, if you take a read of the ingredients, you'll noticed that it's mostly filler and low quality with a bunch of stuff that resembles a chemical company catalogue. So, in my experience: 1) this food is low quality; 2) there is no scientific evidence, in the mainstream scientific community to support it's nutritional claims; and 3) my cat had a severe reaction to eating this food. I strongly recommend you explore other options before considering this food. Thanks for the article, I was wondering what I could do to help my kitty with its nutrition for its thyroid, This should be able to help me quite a bit. I write this to show that for some cats there may be an alternative to surgery , iodine treatment , medication and a presciption diet. He had part of his thyroid removed and within 4-6 weeks we noticed a distinct improvement . He put on 250 gms in weight his coat improved and he started to go out of the house again every day. Unfortunately the improvement was short lived and after a few months he started to rapidly lose weight again until his spine and rear leg bones were clearly showing and his coat was thin and lacklustre . He looked awful. We discussed further surgery with the Vet but I was concerned that Peanut might deteriorate further if his Parathyroid glands were damaged or too much of the remaining thyroid tissue removed. The Vet prescribed Vidalta which Peanut took on and off for approx 4 months but he would have spells of 4 or 5 days of violent vomiting and scratched his face until it bled and with his lack of interest in food we decided to take him off the Vidalta. We decided that we would allow Peanut to live out the rest of his life without the stress of continual Vet visits (which stressed him considerably) and without further medication or Surgery .Instead we decided to feed him on a high protein diet with nutricious natural foods rather than proprietary pet foods and make sure that his remaining time with us was the best quality of life we could give him. His diet consists of Cooked chicken breast, Beef , Tuna, Salmon, prawns, egg yolks and occasional titbits of butter or cheese . This is supplemented with proprietary wet cat foods every day .He has stedfastly refused to eat any dry foods for nearly 2 years. We have had a fantastic year with Peanut and he shows no sign of leaving us any time soon allthough he has occasional bouts of not eating for a day or two and drinks and pees a lot, his kidney condition seems to have improved slightly and he is a very happy cat living a full and active life. If your cat doesn't tolerate the y/d, then you must use one of the other treatments for hyperthyroidism, especially if the condition is severe. Talk to your veterinarian about what to do. Hello & THANK YOU for sharing such important knowledge w/all of us who care SO much about our pet companions! I have a 12 year old female Tuxedo cat who very recently was diagnosed in the very early stages of hyperthyroidism. I almost lost her to heart failure 2 years ago, and since then, she has been on 3 pills each day (5mg Lasix, 1/4 of a 25mg Atenolol, & 2.5 Enalapril) with a 1/4 pill of low-dose aspirin every 3rd day. Because of her heart disease, the surgery & radioactive treatments are NOT an option. My vet prescribed either the y/d diet, or Methimazole 2.5mg 2x a day. My cats health, other than her heart issues, has been EXCELLENT. Her bloodwork results has always been exceptionally good, her muscle tone & mass excellent, and a really great coat (my vet has continuously commented on how great her bloodwork & coat is, as well). She has tolerated her heart med's very well over the past 2 years. She has been fed only Wellness & California Natural brand food's for her 10 years w/me (NO human foods) & only highly filtered water. I have been feeding her the y/d for the last 2 1/2 weeks, but after reading some of your blog/posting's, I'm concerned I'm not giving her good nutrition anymore (I suspected there would be a trade-off regarding the diet switch, anyway...). Knowing the fact's I've given here (& in your opinion)- Would it be better to get her back on her old diet, and start her on the Methimazole (hoping she tolerates it)? THANK YOU. The main downside of methimazole is that you have to give oral mediation, which you are already doing so that should not be a problem for you. If this were my cat, I would stop the y/d and do a trial with methimazole as the first treatment. If that fails, you can always go back to y/d. I'm so thankful to have found your blog. My 12.5 year old kitty has been experiencing short idiomatic seizures since October. We only witnessed them three times, and we've had her blood work run twice since then. In October, her T4 value was just on the edge of the "grey zone" (as my vet put it), hovering around 4.1. After another cluster seizure event this weekend, her T4 values were found to be 7.1. All other blood work was perfect, including all kidney values. Her appetite/thirst has increased, and she had a very slight weight loss (1 lb over the course of 2 years - she currently weights 6.5 lbs. and had no decrease from October to today.) The only other symptom they noted this week was that her heart rate was elevated. Our vet has given us two options: methimazole and the Hills diet. After researching both, I'm a bit skeptical. The I-131 treatment seems like it would be a much smarter route, but since seizures are not a common side effect of hyperthyroidism, I'm wondering if that would be too extreme of a treatment, and ultimately a waste if there's another underlying factor. Late-onset seizures could certainly be caused by a mass or tumor of the CNS, so that is a big issue here. Radioiodine would certainly be best in a 12.5 year old cat with no other issues but you just don't know with your cat. I'd vote for methimazole for now but then see a neurologist once the hyperthyroidism is stabilized if the seizures continue. In rare cases, hyperthyroidism will actually lead to mild seizures, which resolve once that is treated. Thank you for all this good info. I have two 15 year old cats who have just been diagnosed with hyperthyroidism. I will never go near methimazole again; I had a cat whom it damaged terribly. For several reasons, I really want to avoid the radioactive iodine treatment. I have two questions: 1.I keep reading that the surgery is very risky, but you frequently mention it as a viable alternative. My vet is an excellent surgeon; what are your feelings and your experience about the likelihood of of a very bad outcome? 2.I am trying the L/D (canned only!) for now, and I'd like to avoid iodine completely to see if this method works. But I would also like to try Thyroid Gold just in case it helps at all, as so many people say it does. Does it contain any iodine? I don't want to confound the experiment. With an experienced surgeon, thyroidectomy is an excellent option. No other food other than y/d is made to be iodine-DEFICIENT. Other foods may be lower in iodine but you need deficient levels in order to get the thyroid levels lowered in hyperthyroid cat. Sound really like what nature wanted, doesn't it! As you might suspect, iodine is not just needed for thyroid function. We all need some iodine. Hi, at the beginning I would like to thank you for your excellent blog. My 12 years old cat was diagnosed being hyperthyroid on 03/28/15 based on blood tests T4=73,4 (the reference range is 30-60 nmol/l). On 04/11/15 we rechecked blood test and the value is T4=63,1(30-60 nmol/l) and freeT4=54,4 (9-33,5 pmol/l). The vet suggested trying the Hills y/d diet food before trying the drugs. What do you think I should do: start giving her Hill y/d or start with Vidalta or methimazole? I live in Europe in Poland and I don't have here another treatment i.e. radioiodine. Cat is overall in good conditions, weight 5 kg, but she has very big appetite and increased drinking,she also is a little bit hyperactive. Thanks for the help. The methimazole is more effective and allows one to feed a better diet. This is a progressive disease so your cat would have to be fed the diet forever. I'd use the methimazole over the y/d if this were my cat. Thank you for the answer. What dose of methimazole I should start give? Please review my blog posts about methimazole and then talk to your vet. I can't dictate treatment doses on this blog. Should I stay at the same dose of Methimazole? I'm going to do a blood test for four weeks. Yes, I would stay on the same dose for now. Hi. Has anyone had experience of an allergic reaction of the hills y/d food? My 15-year old cat was on the dry food, but when we changed to wet food he started scratching and has lost a lot of head fur. Any advice welcome.